The signs of the times among Yashar’el really cannot be understood without reviewing one of the most interesting aspects of the practices of the Coheniym under Mosheh, which are these things known as the Lights and Perfections, or in the Hebrew, ha’Uriym v’ha’Tummiym (Urim and Thummim). And you shall make the breastplate of judgment with cunning work; after the work of the ephod you shall make it; of gold, of blue, and of purple, and of scarlet, and of fine twined linen, shall you make it. 16 Foursquare it shall be being doubled; a span shall be the length thereof, and a span shall be the breadth thereof. 17 And you shall set in it settings of stones, even four rows of stones: the first row shall be a sardius, a topaz, and a carbuncle: this shall be the first row. 18 And the second row shall be an emerald, a sapphire, and a diamond. 19 And the third row a ligure, an agote, and an amethyst. 20 And the fourth row a beryl, and an onyx, and a jasper: they shall be set in gold in their inclosings. 21 And the stones shall be with the names of the children of Yashar’el, twelve, according to their names, like the engravings of a signet; everyone with his name shall they be according to the twelve tribes. 22 And you shall make upon the breastplate chains at the ends of wreathen work of pure gold. 23 And you shall make upon the breastplate two rings of gold, and shall put את eth-the two rings on the two ends of the breastplate. 24 And you shall put את eth-the two wreathen chains of gold in the two rings which are on the ends of the breastplate. 25 And את eth-the other two ends of the two wreathen chains you shall fasten in the two ouches, and put them on the shoulderpieces of the ephod before it. 26 And you shall make two rings of gold, and you shall put them upon the two ends of the breastplate in the border thereof, which is in the side of the ephod inward. 27 And two other rings of gold you shall make, and shall put them on the two sides of the ephod underneath, toward the forepart thereof, over against the other coupling thereof, above the belt of the ephod. 28 And they shall bind את eth-the breastplate by the rings thereof to the rings of the ephod with a lace of blue, that it may be above the belt of the ephod, and that the breastplate not be loosed from the ephod. 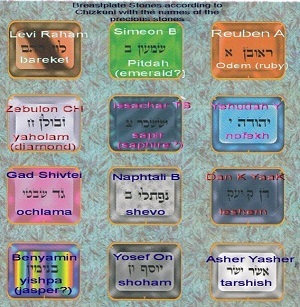 29 And Aharon shall bear את eth-the names of the children of Yashar’el in the breastplate of judgment upon his heart, when he goes in to the holy place, for a memorial before YAHUAH continually. 30 And you shall put in the breastplate of judgment את eth-the Uriym and את eth-the Tummiym; and they shall be upon Aharon's heart, when he goes in before YAHUAH: and Aharon shall bear את eth-the judgment of the children of Yashar’el upon his heart before YAHUAH continually. So, one of the great mysteries of the Torah is unveiled in this verse. Exactly what is the Uriym? And, what is the Tummiym? The Uriym (אוּרִים) (maybe, better pronounced as the Oriym) literally translates as lights. This is much easier understood when it is pronounced Oriym, because we can easily see its root – the word Or (אוֹר), which means light. Uriym or Oriym is merely its masculine plural. 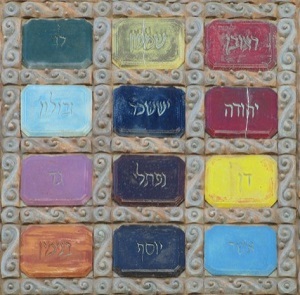 However, it may also be derived from the plural of the word arar (אָרַר) (Strong’s H-779) which means to bitterly curse and in the plural, arriym (אררים), which means bitter curses. The Tummiym (תֻּמִּים), or Tomiym, which is the plural of the word tom (תֹּם) which means completeness; or integrity, or uprightness, or even innocence, is derived from the three-letter root (תָּמַם) tâmam, which means to complete, to accomplish, or to come to the full. Divination by means of the Uriym and the Tummiym then yields a result of cursed/not cursed and innocent/not innocent. We can see the use of the Uriym and the Tummiym when Mosheh passed the kingship over Yasharon to the person he had mentored, namely, Yahusha ben Nun. And YAHUAH said to Mosheh: Take את eth-Yahusha the son of Nun, a man in whom is the RUACH, and lay את eth-your hand upon him; 19 And set him before El`azar the priest, and before all the assembly; and give him a charge in their sight. 20 And you shall put some of your honor upon him, that all the assembly of the children of Yashar’el may be obedient. 21 And he shall stand before El`azar the priest, who shall ask counsel for him after the judgment of Uriym before YAHUAH: at his word shall they go out, and at his word they shall come in, both he, and all the children of Yashar’el with him, even all the assembly. 22 And Mosheh did as YAHUAH commanded him: and he took את eth-Yahusha, and set him before El`azar the priest, and before all the assembly: 23 And he laid את eth-his hands upon him, and gave him a charge, as YAHUAH commanded by the hand of Mosheh. While we do not see exactly how the Uriym and the Tummiym rendered their judgment (it is possible that nothing happening rendered a favorable judgment), we see that Yahusha is nonetheless anointed. While we do not know how this Uriym and Tummiym were used during the age of the Leviyiym priesthood, we do know that following the destruction of the first temple, they were never used again because no priest capable with the Uriym and Tummiym could be found! This is significant in the lineage of the Leviyiym; because many today claim a heritage back to Aharon; yet Ezra could not find any at the time of the rebuilding of the Temple. And of the children of the priests: the children of Chavayahu, the children of Qots, the children of Barzillai; which took a woman of the daughters of Barzillai the Gil`adiy, and was called after their name: 62 These sought their register among those that were reckoned by genealogy, but they were not found: Therefore, were they, as polluted, put from the priesthood. 63 And the Tirshatha said to them: that they should not eat of the most holy things, till there stood up a priest with Uriym and with Tummiym. At the time of Ezra, an impasse was reached that was insurmountable, because they could not find anyone who, being reckoned by genealogy, could stand up with the Uriym and the Tummiym. So, when did this change? Now, let us take a look at a phenomenon that occurred over the last 70 years. While it is true that the official Jewish calendar approximates certain moon sequences, relying on the sighting of the moon to begin the month, the calendar in accord with scripture lands the full moon on the 15th day of the month, every month. For those of us who follow the feasts of YAH, we know that Matstsah (Unleavened bread) begins on the 15th day of the first month of Aviyv, and that Cukkoth (Tabernacles) begins on the 15th day of the seventh month of Eythaniym. Given these dates, lunar eclipses on these full moons create an illusion called a red moon, which some people see as significant. Here is the latest sequence. When we look at such sequences, a question arises as to whether we should consider such signs in the heaven at all. Aren’t such things the practice of Astrology? And the answer is: no. 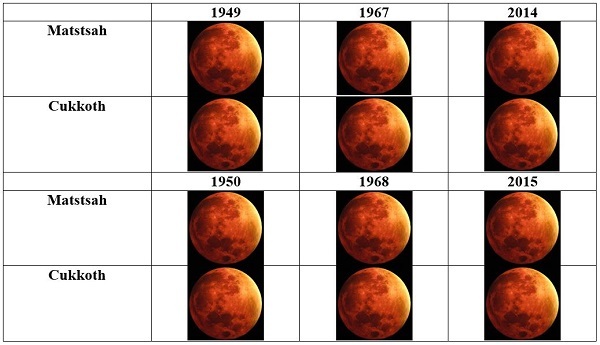 While there was much discussion concerning these blood moons during 2014 and 2015, there was little discussion about the meaning of these moons as signs. Some would say these signs mean trouble for Israel, or trouble for the Jews or something else; however, those arrive without substantiation. Yet, we see the relationship between these signs in the heavens and the Uriym and Tummiym, don’t we? And we note that the blood moon eclipse of September 28, 2015 was also a Super Moon. But the full sequence of the blood moon eclipses gives us a complete judgment of the Uriym and Tummiym. Does it say guilty or innocent? Who is the priest who will stand up with the Ephod?